This Hibiscus Brunch Cocktail is flavored with pear vodka to make it sweet, fruity, and extra girly. All your party guests will be impressed by this one. Every good brunch starts with a cocktail, right? Everyone is familiar with the mimosa, and then there is sangria, but I mixed it up a little with these pretty pink drinks. They would be perfect for a Mother’s Day brunch and would be so fun for a girl’s night out, a spa day, a bachelorette party, or a wedding shower. These Pear Hibiscus Brunch Cocktails are a perfect way to kick it off a brunch. I’ll bring bringing you more brunch recipes all week. Updated: Now that brunch week is over — make sure to check out the sugar cookie bars and the asparagus fritatta! You can also find this loooong list of brunch recipes. 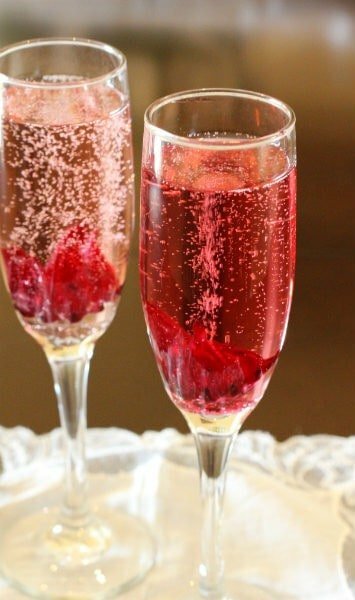 These champagne cocktails are fruity, girly and spritzy. You can tone them down a little by cutting back on the pear vodka. If you notice in one of my pictures that one of the cocktails is a darker shade of pink, that is due to the amount of hibiscus syrup that went along for the ride with the Hibiscus Flower (affiliate link). That will also make the cocktail slightly sweeter. 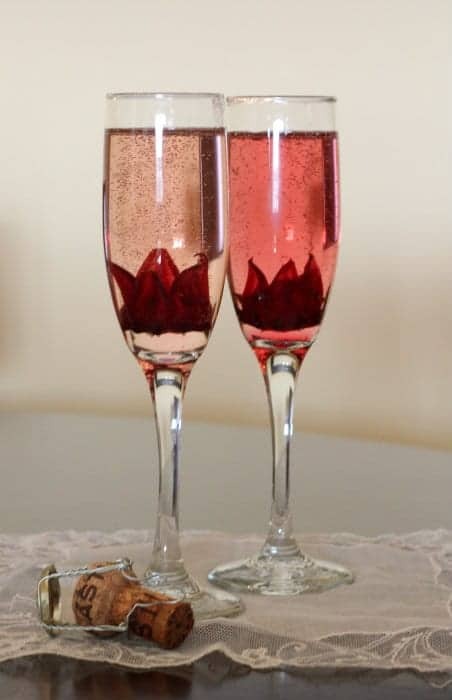 Place hibiscus flower in the bottom of a champagne glass. Add vodka and then top off glass with champagne. Serve immediately. Repeat entire recipe for as many cocktails are needed. Husband’s take: He likely wouldn’t be caught dead drinking a girly drink like this. Difficulty: The hardest part is opening the bottle of champagne. That looks soo good!! 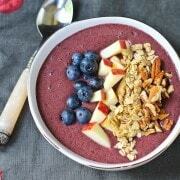 Thank you for sharing your recipe :) will definitely give this a try! Your Pear Hibiscus cocktail sounds wonderful and looks so elegant. I gotta get some hibiscus on hand to try this out. 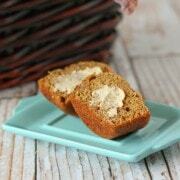 Your chocolate chip muffins look fab! Your new frittata looks great! I can’t stop staring at this. Divine! My favorite brunch food is a poached egg on a bed of roasted asparagus covered in Julia Child’s hollandaise sauce. Ooooo…eeeee…love me some champagne cocktails! I’m also loving this brunch week, fun! I love chocolate chip scones! love champagne cocktails! this looks great!! Pear and hibiscus, what a gorgeous combination, Rachel! Yummy! Those both sound delicious–now I’m hungry! Haha! It is! Glad I’m not the only one. i don’t know if I’ve ever had hibiscus. This looks like a very classy cocktail! Thanks Terri! And thank you for all of your hard work during Brunch Week! haha! I think there is everything vodka. They even make cookie dough vodka. So weird! What a good-looking drink! I bet it tastes divine too! Can’t beat them! What is you favorite flavor of scone? ooh that’s hard… i would say anything with cinnamon or chocolate. or both! I love this cocktail! So pretty!!! This cocktail will be served up at my sister’s birthday party tomorrow night! Thanks for the inspiration. Ooooh fun! Hope you all like it! This. This cocktail is my favorite #brunchweek recipe! Looks so pretty. Thanks Holly! What a compliment! There are so many great cocktails. I love hibiscus! In Spanish is called Jamaica and there’s nothing better on a hot day. YUM! Cool! Love that little tidbit! I love the taste of pear and this drink is so pretty. Where do you find Hibiscus flower?? I bought mine online: http://www.amazon.com/gp/product/B002JKUVG2/ref=as_li_ss_tl?ie=UTF8&camp=1789&creative=390957&creativeASIN=B002JKUVG2&linkCode=as2&tag=notracray-20 (that’s an affiliate link, fyi). Worth every penny for a special occasion, I think! Love the green kitchen aid mixer! 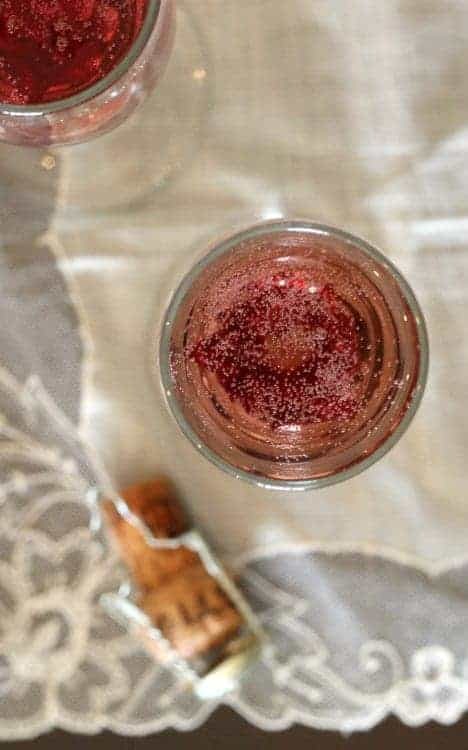 I really love champagne cocktails, they’re always easy to make & so festive! I’ve never tried hibiscus anything – I think! What a gorgeous cocktail! I love how girly it is! 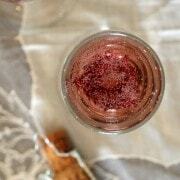 I love adding hibiscus flowers to champagne! So pretty and tasty! Brunch favorite is ALWAYS pancakes. Always. This drink looks gorgeous and I’m sure it tastes amazing, too! “The hardest part is opening the champagne bottle.” Haha… love it! Looks like a gorgeous cocktail for any special occasion! What a beautiful cocktail! I’m impressed by the lighting in your pictures. I can never get back lit photos to look right. These are so pretty and perfect for a girls brunch! You made bubbly even more beautiful! I love this! This is so elegant! The color is amazing! So pretty! My husband wouldn’t be caught dead drinking it either. Wowza that’s alotta prizes girlfriend. You are so right – every brunch needs a good cocktail and this is a great one. Sounds amazing, friend! This drink is so pretty. I don’t think I’ve ever had hibiscus before. What does it taste like? I want to try it. Oh Rachel, this looks fabulous! 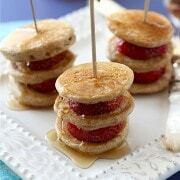 Perfect for mother’s day brunch!